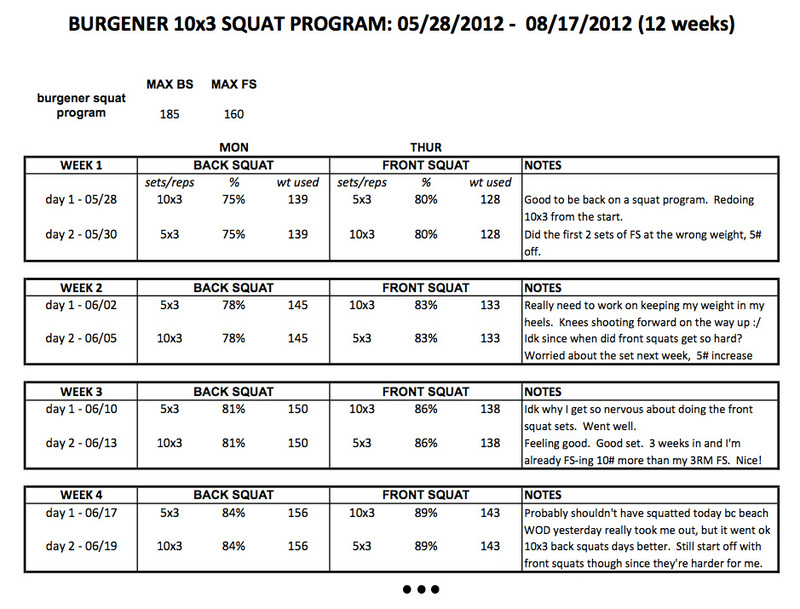 I chose to do the Burgener 10x3 squat program since it had a good amount of heavy front squats. The program is 12 weeks long, two days per week. It is high volume since you will do ~30-45 squats total at a decent weight, each session, for most of the program. No supplemental work this time since it is time consuming and we started getting weekly competition club homework. I don't have all day to spend at the gym! TEMPLATE LOG FOR BURGENER 10x3: xls | pdf | google doc. FRONT SQUATS. After 12 weeks of Burgener 10x3, I was able to front squat my old 1RM for triples! Pretty fricken sweet, I would say! My 1RM (as tested from the last week of this program), increased by ~8lb, or 5%, which may not seem like much after 12 weeks, but I think it is a lot and I am happy with it! Also, being able to do triples at a weight so close to my 1RM consistently, I think is pretty valuable. Clean PRs. Getting out of the pocket in the squat clean used to be my limiting factor for a 1RM clean. Before Burgener 10x3, my old clean PR was 128#... and this was not consistent. I think I missed more at this weight than actually made. Now, my clean PR, as of mid/early July, is 143#... and getting out of that front squat is no problem! Time Expensive. As the front squat sets got heavier (like week 2, haha), I started timing my rest to ensure I got a good three minutes of rest in between each set. So doing the math: just for 10x3 front squats, this is 30 minutes of rest alone, not including the time it takes to warm up to the weight, actually performing the sets, or doing the remaining 5x3 back squats. Oh and this went on for 12 weeks! Sometimes I felt rushed since I don't have much time at the gym. So much to do and so little time. I still wanted to do the class and get a good workout in. Time Commitment. And not just time to do the sessions, or accounting for rest days... but the total time it took to successfully complete the weekly sessions. I had to listen to my body and make sure my legs had adequate time to recover between squat days, while considering our gym programming. It is also a program that cannot be rushed. Initially I tried to do Burgener 10x3 before my Italy trip. Total fail. I tried to cram in some sessions before the trip and failed... and then I tried to pick up where I left off after the trip... and failed. If you are going to do this program, make sure you have time to do the sessions twice a week + flexibility on those days (incase of failed sessions), for the entire duration of the program. The schedule is determined by how your body feels... especially if you are doing this program along with CrossFit or whatever. There were days when I tried to do the program and mid-way through warm up stopped because I knew it wasn't going to happen. My legs were too sore. A pretty crappy feeling.. not just because I did not get what I intended on doing, but also because I just wasted an hour (when I could have been sleeping instead). Time is so valuable to me and one of my biggest pet peeves is wasting time. I probably sound insane at this point. Whatever. Stress and the Mental Game. This program is TOUGH, both physically and mentally. Again, this is definitely the hardest and most challenging squat program I have done to date. Seriously, I was stressing out over whether or not I will make the next set Then I'll look at the work for the next week and stress out more, haha. It is also the only squat program where I missed a set and had to redo it. I could not do the assigned reps just any day of the week... and not being able to control that (i.e. going on how my body feels) drived me crazy. On days when I was physically good for a session, sometimes I would miss a set because I freaked out and got scared... particularly during the last few weeks of this program. My mind had to be set right to successfully work near my limits. The 10x3 Squat Cycle dramatically improved my confidence under the bar. Final thoughts. There is brilliance in this program, and the payoff is huge if you stick to it. You will put in a lot of work every week. The sets do not get easier. This program pushes you to your limits and you have to be willing to fight through those sticking points. That said, you will lift heavy weights gain confidence under the bar, and get stronger. At the end of this program, I was able to do three reps at my old front squat PR! I also developed a lot of overall core strength, and quad and lower back strength from those front squats! The benefits also translated to my back squat, deadlift, and especially, the clean. I had one of the biggest PR jumps for my clean since starting CrossFit. The most common complaint of I've read about this program is the frequency, as it is lower than most programs. But I think if you do the full program, you should be fine. Jes' Burgener 10x3 Log. Check out my Burgener training log and thoughts in [xls | pdf | html | google doc]. 2. My Burgener 10x3 log preview. Some pictures: I forgot to take pictures during this squat program so I'm just going to post some from Occupy Strength, which occurred near the end of this cycle anyway. 4. power clean @ occupy strength. 5. back squats. my favorite. Next up is Tim Swords' Squat Program, as recommended by Catalyst Athletics. I will be starting barbell club there soon and that is squat program they suggested for me.